It’s time to come clean: there is not a one-size-fits-all solution when it comes to optimizing your systems for maximum marketing-based reporting output. So if you’ve been perusing the Interwebs looking for a recipe that you can cut and paste into your situation, you will likely come up short. I know because I’ve tried to find “the answer” too: I’m like the Indiana Jones of reporting research. Let me help you – there is no Temple of Reporting, no Holy Report, and no mythical Crystal Report that some companies have and you’re missing out on. It’s true that marketing leadership in all kinds of companies want to know which efforts are the best investments and should be continued. Where things differ is in the systems used to capture data that will answer that question, and in how to best architect those systems. There are many ways to do this, but which one is the right way? To answer that riddle, we look to compartmentalize our campaign reporting. This is simply a way to look at how your organization can move from basic to advanced, and finally to Olympic-level reporting. We all know it’s best to crawl before we sprint, but you can crawl methodically and set your system up to sprint later, when you’re ready. **I should note that while much of what is outlined below can be applied to small business setups that use only spreadsheets and a database, the more advanced reporting requires the use of marketing automation and CRM systems (specifically Marketo and Salesforce – though this is not necessarily an endorsement but more of an acknowledgement). Identify all the entry points into your database: web forms, imports, human entry, etc. Standardize the values that will be used to identify these entry points going forward. Update any entry points with standardized values, and retro-fit any existing records to conform. **This pattern of system fortification can be used for every compartmentalization step, by the way. Congratulations – you can now report on where all the records in your database have originated. Use that information to figure out volume and activity of those records, and then decide which points of origin are the best for your business. The natural progression from Step 1 is to seek further detail about the origin of records and what efforts produced them. Now we are in need of applying tracking methodologies. At DemandGen, we find ourselves frequently referring to a tracking foundation built using common Google Analytic terms: source, medium, content, campaign. These UTM (Urchin Tracking Module) parameters can be found in most links today as: utm_medium, utm_source, etc. While I’m implying a heavy digital marketing approach with this methodology, you can apply UTM parameters behind the scenes of vanity URLs used in print and broadcast marketing as well. It might take some time to work out what standardized values or naming conventions your organization wants to use for these UTM parameters going forward, but it is a critical step that should not be skipped. It’s time to apply your freshly standardized utm parameters to ALL of your entry-point URLs. Yes I said it. ALL of them. Check out this easy Google-based URL builder for help. Congratulations – you can now report on the detail of which points of origin are producing records in your database. You can also aggregate which channels are producing records, and what offers have been most successful at driving their creation. Now that we have a decent foundation for capturing standardized data, we can focus on the nitty-gritty campaign details that will complete our reporting picture. Let’s talk about money. Cash. Mean green. Dinero. You get where I’m going with this, right? ROI – Return on Investment. How do we configure our system to close-loop our origin data with resultant data? Next, we fine-tune the association of campaign membership to the creation of an opportunity. Typically, this involves passing the most recent campaign name into a field on your opportunity, most commonly the Primary Campaign Source. As members of your campaigns convert to opportunities or customers, you will then be able to report on what you initially spent to acquire and engage that record. The pièce de résistance comes into play when you view any opportunity amount generated by that record and compare it to your cost to acquire the record. Ideally, we’re talking about positive ROI, but if it’s negative ROI, then this information will help you make decisions about continuing that particular marketing effort. Congratulations – over time, your collection of utm parameter and campaign data on records and opportunities will help you calculate ROI. You’ll know the origin of each record, how much you spent to acquire it, and if an opportunity amount is associated with it. This is the best part of completing your compartmentalization of campaign reporting: now we bring out the big guns. 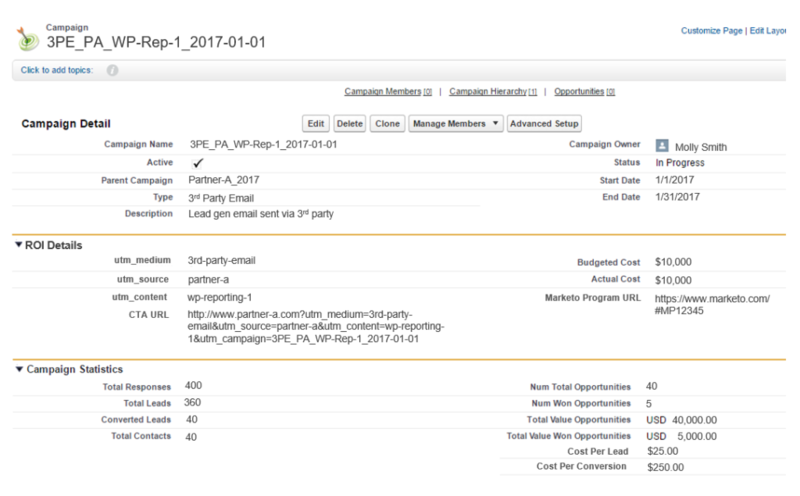 If you have Salesforce as your CRM system, then the best integrated campaign-based reporting tool on the market is Campaign Attribution Analyzer (or CAA for short) by DemandGen. How does it work? We will continuously snapshot all of the data you have set your systems up to capture throughout a record’s lifecycle. Once you’ve got the CAA integrated in Salesforce, it will then help you view several attribution models, which can tell you what has been most successful for generating records that convert: first touch, last touch, multi-touch, and multi-touch weighted. In fact, CAA is like a stout caffeine injection to Salesforce reporting, and will assist you in both high-level reporting and granular-level reporting by expanding beyond the Salesforce reporting limitations you have, or will, encounter. You will be able to make sound budgeting, content creation, effort allocation and even asset design decisions going forward. The best part is, you will have solid reporting proof to back up your decisions. Congratulations – you have reached campaign reporting nirvana. Namaste. **For more details or a demonstration of Campaign Attribution Analyzer, reach out to us. Sarah Wight, Solutions Architect at DemandGen, is a seasoned technical administrator and strategist with 13 years of experience using Salesforce CRM and 7 years of experience using Marketo Marketing Automation. She is adept at building custom-fit marketing data stack solutions for companies of all sizes, in all industries, with a keen focus on functional attribution that fuels powerful reporting. Sarah is passionate about helping her clients make their marketing efforts highly visible, maintaining clean data, and optimizing the use of today’s leading marketing software.